The Biennale des Bains Numériques, a key event on the contemporary digital arts calendar, is celebrating its tenth edition. 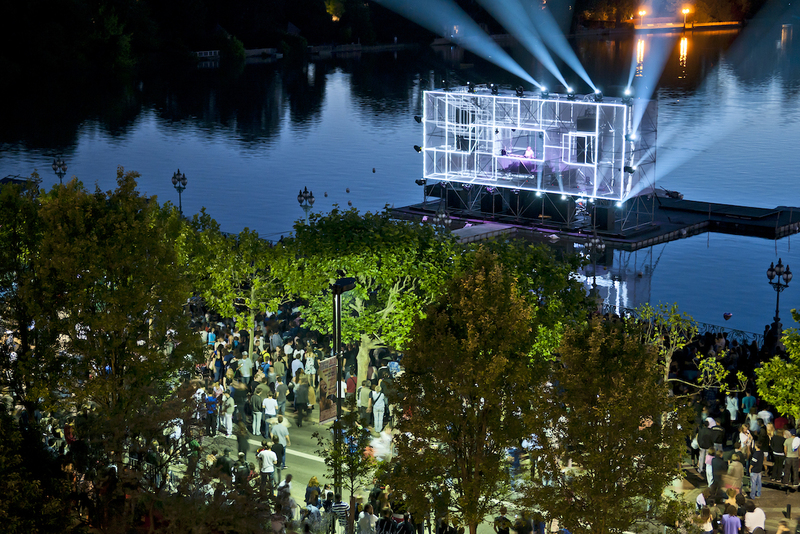 Over a period of 4 days, this international event will take over Enghien-les-Bains with a guided visit circuit throughout the town, as well as concerts, exhibitions, shows, an international competition and a fair dedicated to innovation and the digital arts. Opening the series of concerts is IA, a virtual singer endowed with artificial intelligence. The closing concert will feature the famous French electronic dance music artist Vitalic. 10 major and pioneering digital artists will be presenting a series of exhibitions and installations: Yoichiro Kawaguchi, Orlan, Catherine Ikam, Alex Verhaest, Miguel Chevalier, Maurice Benayoun, Stelarc, Bill Vorn, Eduardo Kac and N+N Corsino. The event, which endeavours to reveal the artistic and social potential of digital art, is open to all and admission is free. How can we imagine man’s place in urban society in the future? The 4th industrial revolution, which will lead to the fundamental transformation of our societies, notably because of artificial intelligence, robotics and big data, provides an opportunity to create new models for sustainable production. At a time when a study has revealed that 85% of jobs that will exist in the future haven’t been invented yet, can art in the all-digital world embody a high perception of knowledge? It is to this end that the “Bains Numériques” festival fosters an immersion in art, science and society. How can creativity be a catalyst for sustainable development? As Arthur Danto said: “Art is everywhere where there is nowhere else to go”, a quote that sums up the central role that digital art will play in society and mankind’s value chain in the future. What perspectives will it allow us to catch a glimpse of?